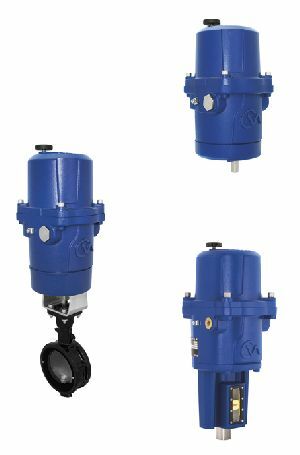 Available in quarter-turn, rotary and linear versions, robust Rotork CMA actuators perform numerous process control valve, metering pump and damper applications. Single-phase or DC electrical power is all that is required for simplified installation and control valve actuation in safe or hazardous areas. Explosionproof certification to international standards is available. The latest ‘Performance Plus’ development introduces a user selectable increased shut-off torque/thrust option. Developed in response to industry feedback, this option enables a more tailored and cost-effective sizing regime to be applied to both the modulating and tight shut-off demands of the control valve. A tight shut-off is often required as part of the valve duty, leading to potential over-sizing of the actuator for mid-travel modulating operations. The increased torque/thrust option is selected and configured during the actuator set-up programme, as part of a logical menu-driven process using an internal electronic LCD display and pushbuttons. A new model size has also been introduced to the rotary CMA design, creating a range that is suitable for virtually all process control applications. Upgrades to internal electronics and HMI enhancements complete the list of improvements across the range. For additional functionality, all rotary CMA actuators have output speeds that are adjustable down to 50% of full speed, in 10% increments. The maintenance-free CMA drive train, permanently lubricated and environmentally protected to IP67, can be mounted in any orientation. Accepting an industry-standard 4-20mA control signal, the CMA provides accurate and repeatable positional control. Resolution is 0.2% on linear and quarter-turn applications and 2 degrees on the multi-turn models. Manual operation is available as standard whilst optional extras include local pushbuttons and selector switch, digital position indicator and network compatibility with Rotork Pakscan, HART®, Profibus®, Modbus® and Foundation Fieldbus®.